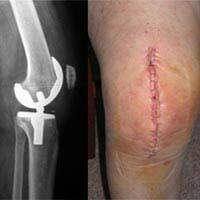 Knee replacement surgery, like hip replacement operations, are now done very routinely. People whose knee joints have become worn by arthritis can experience a great deal of pain and become more immobile over time. Having a replacement joint means having an operation, but three months later, they are able to walk without pain and usually even without the aid of a stick. As with all other operations, you will be checked beforehand to make sure that your blood pressure is OK and that you have no other health problems that would make the operation dangerous. If you smoke, you will be asked to stop several weeks before the day of surgery, as smoking stops healing taking place as quickly. On the day of surgery, you will not have anything to eat and you will be prepared for your anaesthetic and then taken to theatre. What Does Knee Replacement Involve? Having a knee replacement usually involves having all of the inner surfaces of the knee joint replaced, and sometimes at the back of the joint and the knee cap as well. The exact procedure that is carried out will depend on the degree of arthritis in the knee and how far it has advanced. During the operation, a large incision is made from the top of the knee downwards and the knee cap is removed, or put to one side so that the inner part of the joint can be replaced and resurfaced. The operation itself lasts for about two hours and requires a stay in hospital of several days. Unlike a hip replacement, it is possible to have your knee joint replaced with an epidural anaesthetic as well as a general anaesthetic. This means that you can be awake if you would like to, or if it is safer for you. Although the anaesthetic injection in your spine will mean you don’t experience any pain, and a barrier or sheet will prevent you seeing the operation, it can be disconcerting to be aware of the tugging and pushing that goes on as the surgery progresses. To prevent blood clots in the veins in your legs, you will need to wear an elastic surgical stocking on your other leg, and to have special massage, sometimes with a machine, to stimulate the blood flow in the leg that has the new knee. After a few days, you will be allowed home and encouraged by your physiotherapist to be mobile and do exercises. You will be shown how to walk safely with a stick, and to walk up and down stairs. Even though you will feel it is easier to move around quite quickly, it is important to have someone stay with you for the first week you are out of hospital. With careful exercise, you will be able to walk well with crutches and then move on to two sticks, then to one and eventually, after about three months, walk unaided. For the next few months, it is crucial to keep up your exercises and to use the new knee to walk regularly but without overdoing things. When you rest, you will be advised to keep your leg raised, with your ankle higher than your shoulder, so that your lower leg does not swell too much. The UK has an extremely good record in orthopaedics, and the success rates of both knee replacement and hip replacement operations are very high. Death rates are negligible and only 1.4 per cent of new knees need some sort of second operation to sort out a problem. Most people recover quickly and are very pleased with their new-found mobility. There is no age-limit on who can have the operation either, with some sprightly 90-year olds maintaining their ability to walk after getting a new knee joint.